The site was hacked on 15 and 24 May. It is clean now. Thanks to Google for the warning. Change of host and come back of the xmloperator.org alias. LambdaAPI3 release 2.0: applied lambda calculus with constants. 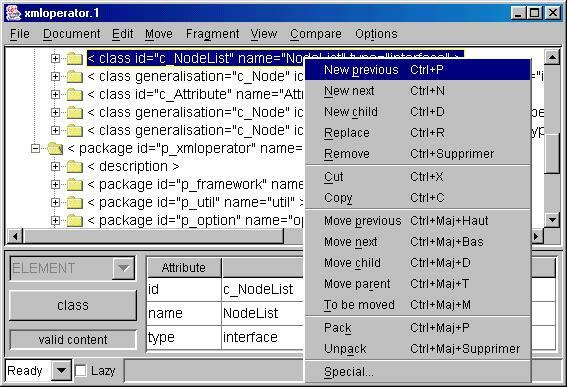 xmloperator is an XML editor, suitable for editing data oriented documents. The software is open source, Java written, released under a BSD-style license. It requires J2SE 1.4 and uses Xerces-J and Xalan-J from the Apache Software Fondation. xmloperator displays a tree view of the nodes of the document. When you select one node of the document, it appears in a detailed view, adjacent to the tree view. You can open several instances of the tool in order to work simultaneously on several documents. Any RELAX NG schema or DTD can be used for guiding editing. ID, IDREF and IDREFS attributes consistent management. Saving of operations while editing avoids any loss in case of system crash. Capability for editing arbitrarily large documents. Document transformations using either a transformer or an XSLT stylesheet (the XSLT engine and the XPath evaluator are provided by Xalan-J). Documents comparison without taking into account the ordering of elements. http://www.w3c.org/ : Word Wide Web Consortium (XML, XHTML, XPATH, XSLT, ...). http://www.apache.org/ : Apache Software Fondation (Xerces, Xalan, Ant, ...). http://www.garshol.priv.no/download/xmltools/ : an invaluable repertory of free XML tools. http://www.relaxng.org/#software : RELAX NG related tools. http://dmoz.org/Computers/Data_Formats/Markup_Languages/XML/Tools/ : a usefull entry point. For more information, please send a mail to "info" at "xmloperator.org" using a subject starting with "[xmloperator]". Project's Individual(s) : Didier Demany.